The inspiration provided by Michele Ferguson (you can see her card at the bottom of the post) was wonderful. I love the potted flowers, and after I started I just couldn't stop. If one is good, then three must be better, right? Moreover, I can't seem to get enough of either the florals by Clearly Besotted or the Zig Markers. They blend so amazingly, and the colour they give off when mixed with water is beyond anything I could have imagined when I first read about them. If you haven't tried them out, I highly recommend picking up a couple. Unlike Copics (also wonderful) you can get various shades with just one marker. 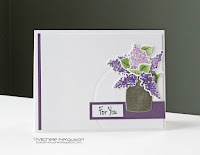 To create this card, I began by stamping the vases from Lawn Fawn's "Our Friendship Grows" stamp set. I then masked them off and stamped each of the floral images from Clearly Besotted's "Miniature Florals Collection" using CTMH Archival Black Ink on 140lb cold press watercolour paper. I coloured them with Zig Clean Color Real Brush Markers. I forgot to write the colours I used down. Sorry, guys! I stamped the greeting using the Archival ink as well, to ensure that the blacks matched. I mounted the panel on a standard A2 sized card base using super sticky tape. To finish it off, I added clear Wink of Stella to the petals of the flowers. Unfortunately, the picture didn't pick it up. But in real life, it is SUPER shiny. Hi Trina!! Yes! I totally agree with your thoughts on MORE! Each one is a charmer, so how could one choose? Darling addition to the Muse gallery! Thanks so much for playing along! Wow, wow, wow! The shading on these flowers is amazing! So glad you joined us at Muse this week, Trina!